These hazelnut rye rolls are a perfect weekend breakfast treat! 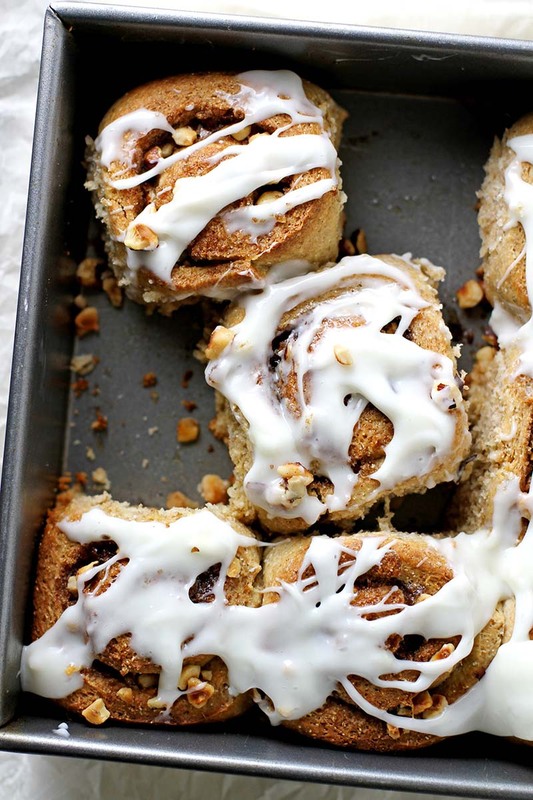 With swirls of toasted hazelnut and cinnamon sugar filling in a pillowy rye dough topped with sweet cream cheese glaze, you'll want to grab seconds (or thirds). In a large bowl or bowl of a stand mixer, stir sugar and yeast into milk to dissolve. Let stand 10 minutes until foamy. Add flours, butter, egg and salt; stir until a dough forms. Use dough hook attachment to knead dough on medium speed 5 minutes, adding more all-purpose flour as needed until dough pulls away from sides of bowl and is smooth, elastic and only slightly sticky; OR, knead dough by hand on a lightly floured surface 10 to 15 minutes, adding more all-purpose flour as needed until dough is smooth, elastic and only slightly sticky. Shape dough into a ball and place in a lightly greased bowl; turn once to coat. Cover bowl with plastic wrap and let dough rise 1 to 1½ hours until doubled. Punch down risen dough. On a lightly floured surface, roll out dough to a 15-by-9-inch rectangle. Brush dough with 1 tablespoon melted butter. In a small bowl, combine toasted hazelnuts, brown sugar, sugar, cinnamon and cloves. Sprinkle mixture over surface of dough, leaving a 1-inch border along edges. From the long end, tightly roll up dough into a log. Use a sharp knife to cut dough into 9 equal-sized rolls. Grease bottom and sides of an 8-inch square pan with butter or cooking spray. Place rolls, cut-side up, in prepared pan. Cover pan lightly with a towel or plastic wrap and let rolls rise 1 hour until nearly doubled. Heat oven to 375°F. Uncover pan and bake rolls 25 to 30 minutes until golden brown. Remove from oven and drizzle 1 tablespoon melted butter over rolls. To make the glaze, beat powdered sugar, cream cheese and milk into a smooth, drippy glaze. Spoon or spread glaze over warm rolls.